Cue can be assigned one of four avatars, each with its own personality. Roll aside, Dash, Cue is in the house. Wonder Workshop’s new robot, Cue ($200), is the company’s follow-up to the popular Dash and Dot and its first product designed for middle school students. With a sleek design, Cue is available in black or white, with programmable chest, side, and eye lights. Like Dash, Cue has four programmable buttons and sensors that detect objects in front and behind. Improving on Dash, Cue’s sensors are larger and more sensitive. The new robot comes with very little equipment: two connector blocks, a power cord, and some decorative stickers. Cue doesn’t need accessories—all the fun stuff is inside. Wonder Workshop has developed an app for interacting with Cue that employs emotive AI. Cue can be assigned one of four avatars, with two male and two female personalities, each with its own style, mannerisms, and appeal. When setting up Cue, use the chat function to connect with each one, hear their voices, and get a sense of the personality before choosing one to download. This reviewer chose “Zest,” the stylish female. Only one avatar comes with the purchase of a Cue robot. If you wish to switch to another character at some point, the download will cost $6. 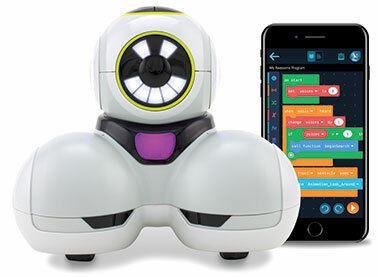 The Cue app interacts with the robot in three modes: create, code, and control. The control feature allows users to drive Cue, manipulating speed, direction, and sounds. While in control, Cue can be set to seek or follow a nearby object, avoid obstacles in front or behind, or explore, meaning Cue roams the area on auto-drive, sensing and avoiding obstacles. Using the code feature, users can write programs for Cue in either Blockly or Java Script. Code has an adventure option, which leads users through a series of challenges aimed at teaching the coding language and all of the programmable elements in Cue. The create function houses a picture-based programming language that is an advanced version of the one in the app for Dash and Dot. Users can create more complex programs by dragging elements onto the workspace and connecting them with arrows. Like the Wonder app, the Create language will help users quickly unlock the more complex things Cue can do. Cue is a powerful teaching and learning tool, long on personality and appeal. Kids will love it right out of the box. Users who are familiar with Dash will recognize Cue’s features but still be challenged by the more robust coding capabilities and codable elements. Also, while Wonder Workshop has a wealth of educator resources for Dash and Dot—there’s very little so far for Cue. The in-app purchases required to download another avatar or additional chat-based challenges could also be unmanageable in a classroom. Finally, because Cue has a very different AI and a separate app, it cannot be programmed to interact with Dash and Dot, nor can it be used with other Wonder Workshop apps. One hopes that a Cue app family is in development. Cue is an engaging, powerful toy for older kids who are interested in robotics and programming. It is perfect for play at home. Educators will be inspired to use Cue to engage their students in coding activities. But with few Cue-specific resources, early adopter educators will be working from scratch. Dot has been re-released as the Dot Creativity Kit ($80). Same great Dot—now in a bright lime green—but with accessories. The Creativity Kit contains the Dot robot, connectors for attaching Dot to cardboard and LEGO constructions, one squishy case, the materials needed to turn Dot into a mood lamp, and an array of stickers and cardstock costumes. While accessories are fun, the real juice is in the activity cards that accompany the kit. Each activity uses something from the kit and a pre-loaded program in the picture-based Wonder programming app. One activity, “Robo Sentry,” turns Dot into a motion detecting alarm to hang on a doorknob. In “Fortune Teller Bot,” kids can create a talking Magic 8 Ball. Use the Wonder app to unlock the true programming power of Dot. The intuitive images allow young coders to create fun, interactive programs, which would require much more complex code in Blockly. Each Creativity Kit activity card enables kids to modify or customize an existing program. As any programmer will tell you, that is the foundation of learning to code.